Our injection treatments are safe, convenient, and relatively painless. Through personal consultation, we will help you decide which is right for you. Botox® Cosmetic is made from a purified protein and commonly used to reduce the appearance of facial wrinkles, including crow's feet, frown lines, forehead lines, neck lines, nose wrinkles and smoker's lines. Botox® is administered in tiny amounts precisely injected into facial muscles around the eyes, forehead and mouth. These injections block nerve impulses, temporarily weakening muscles so that the wrinkles that form with excessive facial movement are diminished. After treatment, the overlying skin remains smooth and unwrinkled while untreated facial muscles contract normally, allowing normal facial expression to remain unaffected. The treatment gives the face a rejuvenated, relaxed and younger look. In addition, Botox® can also be useful to stop sweating under the arms. No. A topical numbing cream and very fine needle is used to administer Botox® so the pain associated with the injections is minimal to none. No sedation or local anesthetic is required, and you will be able to drive and engage in all of your usual daily activities immediately after your injections. We do ask that you remain upright for 4 hours after treatment and refrain from massaging the treated area. You may have slight temporary bruising of the skin at your injection sites, but otherwise there will be no visible signs of your treatment. It is wise to schedule your Botox® treatment 2 weeks before an important event, just in case you get a small bruise. Botox® results are not permanent. The effects of Botox should last between three and six months on average. The exact duration of results depends on several factors, such as the dosage, the application, the anatomy of the patient, and the area that was treated with Botox®. The effects generally take effect 4-7 days after the first treatment. Repeat injections are administered at your discretion when muscle function returns. Over time, as these muscles begin to lose their strength, intervals between sessions may lengthen, so that injections can eventually be spaced 5-7 months apart. Like Botox®, Dysport™ is an injection treatment that is used to temporarily improve the look of facial wrinkles by reducing facial muscle activity. 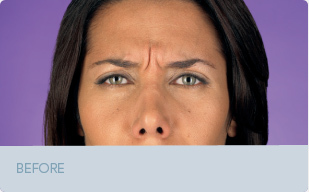 It specifically targets the glabellar lines, or severe frown lines, that appear between the eyebrows. Our Dysport™ procedure follows the same guidelines as our treatments using Botox®. Dysport™ has been in use in countries around the world since 1991. It was approved for domestic use by the FDA in 2009, after extensive U.S. clinical trials tested its efficacy and safety in over 2,400 aesthetic patients. Today, it is one of the leading injection-treatment alternatives to Botox®. If you would like to learn more about Dysport™ and why it may be the preferred treatment to enhance your skin’s health and appearance, feel free to contact our practice.